July is as good a month as any to celebrate the hacking culture. The always exciting area of expertise pits savvy minds against seemingly impenetrable electronic safeguards, for a variety of reasons. In some cases, that reason involves bringing down an oppressive government, as is the case in Hacktivist from Archaia and BOOM! Studios and the brainchild of Alyssa Milano. The book was written by Jackson Lanzing and Collin Kelly, illustrated by Marcus To, colored by Ian Herring and lettered by Deron Bennett, all of whom must be psyched that it's getting the hardcover treatment. 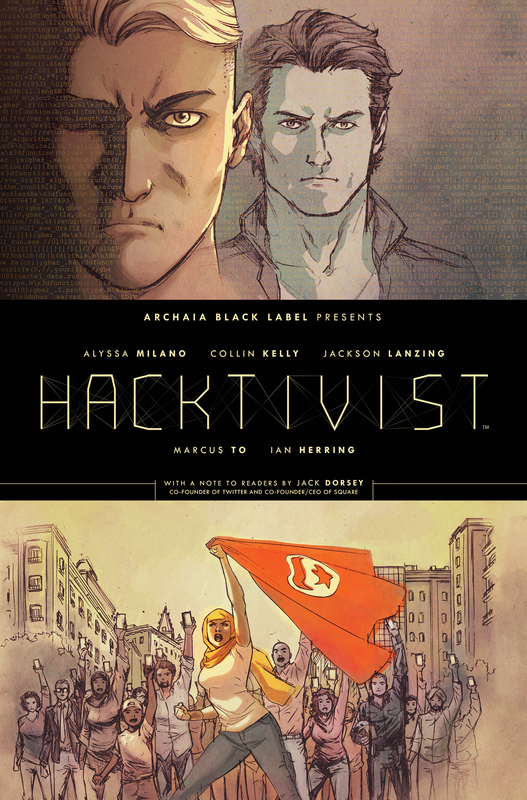 The Hacktivist hardcover collection arrives from Archaia in comic shops on July 16th and bookstores on July 22nd with a cover price of $24.99 under Diamond Order Code MAY141168 and ISBN 978-1-60886-409-6. Jack Dorsey, the co-founder and co-creator of Twitter and founder and CEO of Square, who inspired Milano to create the story, provides a Note to Readers in the book, which also contains an interview with real-life hacker and inventor Pablos Holman and commentary and early process work from the creative team. The HACKTIVIST hardcover collection arrives from Archaia in comic shops on July 16th and bookstores on July 22nd with a cover price of $24.99 under Diamond Order Code MAY141168 and ISBN 978-1-60886-409-6. Not sure where to find your nearest comic retailer? Use comicshoplocator.com or findacomicshop.com to find one!